AZ Partmaster recently leased 46,360 square feet of industrial space in Polaris Crossing at 3326 Ponderosa Way in Las Vegas. Courtesy. ▶ Power AZ LLC purchased 3,198 square feet of retail space at 607 W. Craig Road in North Las Vegas from Moses Revocable Trust for $2.8 million. John Blommer of Virtus Commercial represented seller. ▶ V Center LLC purchased 0.63 acres of land at 1845 Village Center Circle in Las Vegas for $560,000. Brian Fike of Colliers International represented the seller, 1845 Village Center LLC. ▶ Las Pupusas Restaurants LLC leased 2,000 square feet of retail space at 7680 Las Vegas Blvd. South, Suite 203, for $975,003 and 125 months. Nelson Tressler and Michael Zobrist of Newmark Grubb Knight Frank represented the Las Pupusas. Liz Clare of Avison Young represented the landlord, LB-UBS 2007-C6 Annex REO LLC. ▶ GoAuto Management Services LLC leased 1,400 square feet of retail space at 205 W. Centennial Parkway, Suite 150, in Las Vegas for $107,835 and 60 months. Nelson Tressler and Michael Zobrist of Newmark Grubb Knight Frank represented the landlord, Centennial Commerce LLC. ▶ Giddy Inc. leased 67,584 square feet of industrial space in Prologis Sunrise Industrial Park at 2970 N. Lamb Blvd. in Las Vegas. Dan Doherty, Susan Borst, Chris Lane and Jerry Doty of Colliers International represented the landlord, Prologis NA3 NV LLC. 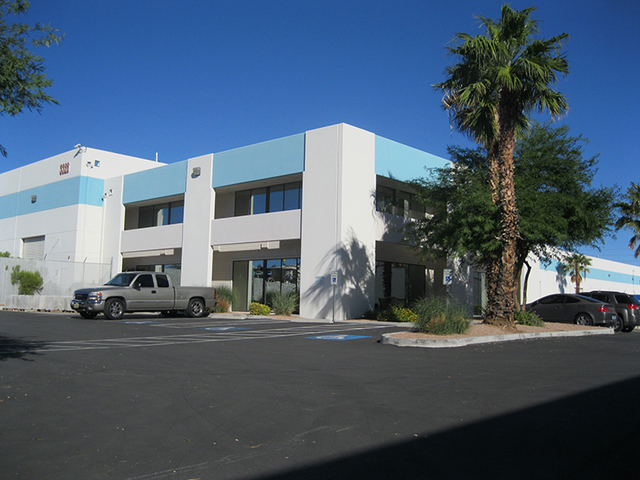 ▶ AZ Partmaster leased 46,360 square feet of industrial space in Polaris Crossing at 3326 Ponderosa Way in Las Vegas. Dan Doherty, Susan Borst, Chris Lane and Jerry Doty of Colliers International represented the tenant. ▶ Glowzone LV LLC leased 35,877 square feet of industrial space in the Arroyo North Business Center (Phase I) at 6630 Arroyo Springs Street, Suites 1100 and 1200, in Las Vegas. Spencer Pinter of Colliers International represented the landlord, EJM Arroyo North I Property LLC. Phillip Dunning, Dan Doherty, Susan Borst, Chris Lane and Jerry Doty of Colliers International represented Glowzone. ▶ Central Telephone Co. leased 25,000 square feet of land in the Stanley Office Park on Teco Avenue near Sunset Road in Las Vegas. Greg Pancirov and Mike DeLew of Colliers International represented the landlord, Stanley Office Park LLC. ▶ Eagle Graphics Systems Inc. leased 7,470 square feet of industrial space in Arrowhead Commerce Center (Building 1) at 6290 S. Pecos Road, Suites 500 and 600, in Las Vegas. Spencer Pinter, Dan Doherty, Susan Borst, Chris Lane and Jerry Doty of Colliers International represented the landlord, KTR LV IV LLC. ▶ PDS Gaming Corp. leased 7,000 square feet of industrial space in the Mojave Airport Center at 6255 S. Mojave Road, Suite B, in Las Vegas. Dean Willmore, Mike DeLew, Greg Pancirov and Chelsy Cardin of Colliers International represented the landlord, Stockbridge Patrick and Mojave LLC. Suzette LaGrange and Kara Walker of Colliers International represented PDS Gaming. ▶ Salus Uniforms Inc. leased 6,677 square feet of industrial space in Valley Freeway Commerce Center at 7665 Commercial Way, Suite C, in Henderson. Greg Pancirov and Mike DeLew of Colliers International represented the tenant. ▶ AAA – American Automobile Association leased 6,000 square feet of retail space in Rainbow Plaza Shopping Center at 937 S. Rainbow Blvd. in Las Vegas. David Grant and Rebecca Staniec of Colliers International represented AAA. ▶ Central Telephone Co. leased 4,431 square feet of industrial space in Stanley Office Park at 6420 Cameron St., Suite 206, in Las Vegas. Greg Pancirov and Mike DeLew of Colliers International represented the landlord, Stanley Office Park LLC. ▶ Victory Martial Arts leased 4,140 square feet of retail space in Centennial Crossroads at 6400 Sky Pointe Drive, Suite 110-140, in Las Vegas. Preston Abell and Jeff Mitchell of Virtus Commercial represented the landlord, Excel Centennial, and Jennifer Weinberg of Sunbelt Business Brokers represented the lessee. ▶ Payless Shoes leased 3,000 square feet of retail space in Crossroads Town Center at 6436 N. Decatur Blvd. in Las Vegas. Preston Abell and Jeff Mitchell of Virtus Commercial represented the landlord, CREF X LV Crossroads Inc.
▶ Iglesia Ministerio Cristiano leased 3,000 square feet of retail space in Tropicana Spencer Center at 1775 E. Tropicana Ave., Suites 11-13, in Las Vegas. Brett S. Beck of Virtus Commercial represented the tenant and Brett S. Beck and Jeff Mitchell of Virtus Commercial represented the landlord, MZ Properties LLC. ▶ Dr. Steven E. Grant OD PC leased 2,010 square feet of office space in Horizon Village Square at 70 E. Horizon Ridge Parkway, Suite 160, in Henderson. Chris Emanuel represented the landlord, HVS Partner. ▶ Meal Prep LV LLC leased 1,400 square feet of retail space in Lake Mead Promenade at 6430 W. Lake Mead Blvd., Suite 145, in Las Vegas. Troy Tobler and Amy Nguyen Virtus Commercial represented the landlord, Martinez 2008 Revocable Trust. ▶ Sarah C. Heiner MD PC leased 1,238 square feet of office space in Horizon Village Square at 70 E. Horizon Ridge Parkway, Suite 100, in Henderson. Chris Emanuel of Virtus Commercial represented the landlord, HVS Partner. ▶ Paradigm Services leased 1,200 square feet of retail space in Black Mountain Marketplace at 72 W. Horizon Ridge Parkway, Suite 145 in Henderson. Chris Emanuel represented the landlord, Blk Mtn 1 &Blk Mtn 2. ▶ Joseph Stevenson dba Raptor Websites, leased 1,179 square feet of office space in Aug.a Park at 1481 W. Warm Springs Road, Suite 141, in Henderson. Robert S. Hatrak II of Virtus Commercial represented the landlord, Augusta Park 8, LLC.